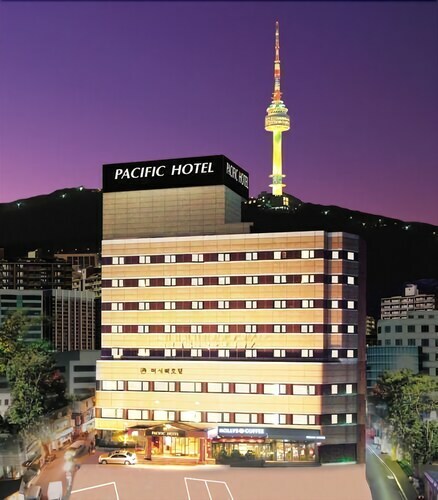 Located in Myeongdong, this hotel is within a 10-minute walk of Namsan Park and Myeongdong Street. Seoul City Hall and Gyeongbok Palace are also within 2 mi (3 km). This hotel features a restaurant, a health club, and a bar/lounge. Free WiFi in public areas and free self parking are also provided. Other amenities include a coffee shop/café, a 24-hour business center, and valet parking. All 181 soundproofed rooms feature free WiFi and minibars. For a bit of entertainment, LCD TVs come with cable channels, and guests can also appreciate conveniences like refrigerators and electric kettles. The hotel offers a restaurant and a coffee shop/café. A bar/lounge is on site where guests can unwind with a drink. This 4-star property offers access to a 24-hour business center. A computer station is located on site and wired and wireless Internet access is complimentary. This Seoul hotel also offers a health club, a terrace, and tour/ticket assistance. Onsite self parking is complimentary. Pacific Hotel has designated areas for smoking. Mirabeau - This restaurant serves breakfast and lunch. Rollaway/extra beds are available for KRW 60000.0 per stay. This property has a sauna and a pool for men only. For more information, please contact the property using the information on the reservation confirmation received after booking. Book a stay in any room or rate plan and children age 7 and younger eat free breakfast when dining with a paying adult.